The club has a large number of experienced and capable paddlers with knowledge and expertise in a variety of kayaking disciplines. Some of them also have B.C.U. Coaching qualifications. They are usually happy to help coach and train less experienced paddlers, both during the regular sessions and whilst on trips. All coaching within the club is done on a voluntary basis. Sometimes the more experienced paddlers are paddling for their own enjoyment and may not be willing to coach at a particular time. 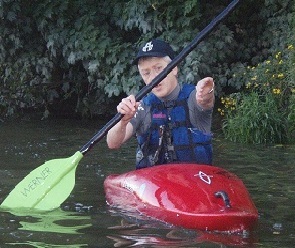 There is a limit to the amount of inexperienced paddlers that the club can cope with and occasionally we may have to restrict the number of new inexperienced members joining the club. Several members have joined the club with no or limited previous paddling experience and have progressed over time from complete beginner to an intermediate or good standard in one or more kayak disciplines. Individual progress is determined by a variety of factors such as confidence, athletic ability, amount of time spent paddling, experience of a variety of paddling disciplines etc. The Paddler Progression page shows details of the various club sessions and trips and their suitability for your ability level. Videos and books on technique are also a great way to learn more about kayaking skills. The B.C.U. organise various performance, leadership and coaching awards. The club does not organise or test any of these awards. Occasionly members interested in gaining specific training or certification arrange training courses or assessment through external suppliers. The additional cost of attending such courses are paid for by the attendees*. If you intend attending such a course, it is worth advertising it to other members of the club via the email distribution list in order to share costs of travel and accommodation together. * The club has a small training fund available to help pay a small contribution towards the cost of courses that are beneficial to our membership. This is only applicable to current paid up members who are regularly involved in the club and help run club trips by providing leadership, coaching and safety cover to less experienced members. The fund is administered by the training officer. There may be other extenal grants availabe to coaches from local government or sporting bodies. This may be worth investigating if you are trying to get qualified as a coach.